Tales of Ineptitude: Call me converted? One of the new things that I've tried lately is switching some things up with my pressing. I'm a tried and true to-the-side presser, but with the Skill Builder BOM this past week I tried pressing seams open. I've done it before, but not with a lot of success. Burned fingers, taking twice as long, etc. And pressing is one thing about quilting that I'm less than enthusiastic about, so I've always tried to just get it done as quickly as possible. So pressing seams open was not something that I was excited about. By alas, I actually surprised myself. It was kinda fun, I didn't burn myself (yet), and it really didn't take as long as I thought. And the seams are so pretty! Here are some comparisons of a block I did a couple weeks ago (seams pressed to the side), and one this past week (seams open). So pretty!! I think open seams look much nicer. People tell me that they're not as strong, that it's harder to stitch blocks together if the seams meet because you may have to pin. About the not as strong part, though.... My mom, gramma, and sister-in-law always pressed seams open and I still have their quilts after many, many years of use. I like open seams, though I agree they may take just a little longer to press. Lovely blocks, by the way. Oh yup! I ALWAYS press seams open. 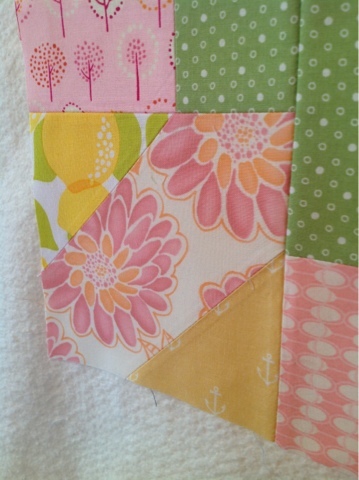 So much easier to quilt, looks great, and it is spool much easier to line up blocks in the right places! I love your "Stawberry Shortcake" bloak. Would make a nice quilt for a little girl or even a cute bedscarf. Glad you are speeding up at open seams. Used to take me a long time and now it's second nature. 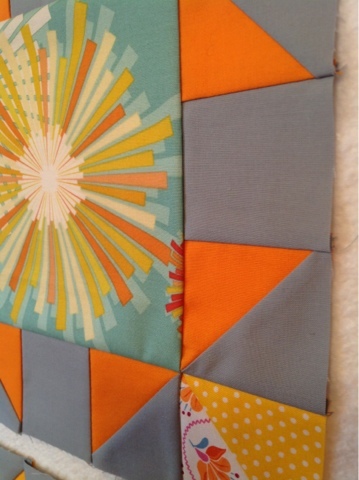 Stopping by from the Freemotion Quilting Project. That sure makes a big difference! I like the fabrics you've used. If you want to be neurotic "which I am" You could do a trick that I use and put a little sizing spray along a seam, right before pressing. Even my seams that are pressed to the side are super crisp and lay flat.